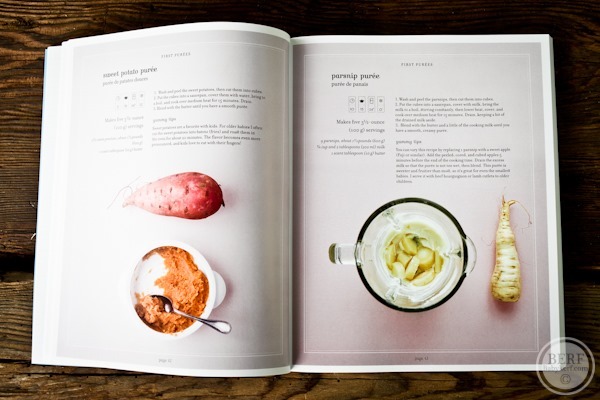 Baby cookbooks are just so….sweet! I have found baby food to be both incredibly simple (puree some peas, yo!) to a bit intimidating (am I incorporating enough flavor?) I was sent this book, Bébé Gourmet, to review and fell in love with its beautiful photography, creative recipes and ability to grow with your child. I’m not sure I’d make a chicken or lamb tagine for Mazen alone, but if our whole family could enjoy it then it’s worth the effort. In some ways this is a regular cookbook with baby friendly techniques. As I said above, the photography is just stunning. 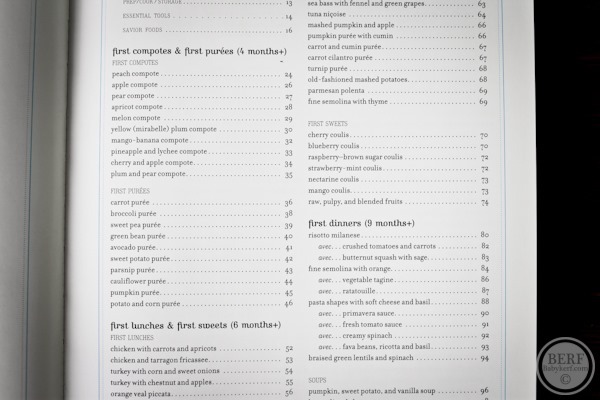 Here’s a peek into the table of contents – recipe categories go from compotes to lunch and dinner categories for older babies. 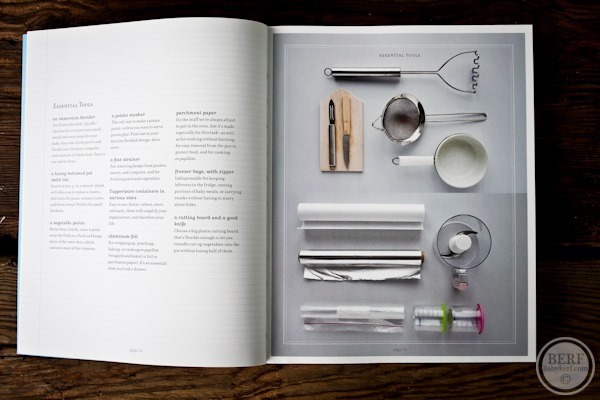 I read through the cookbook in a few nights and am inspired to have Mazen try some new flavors in the coming weeks. This book would make a beautiful gift for a new mom. 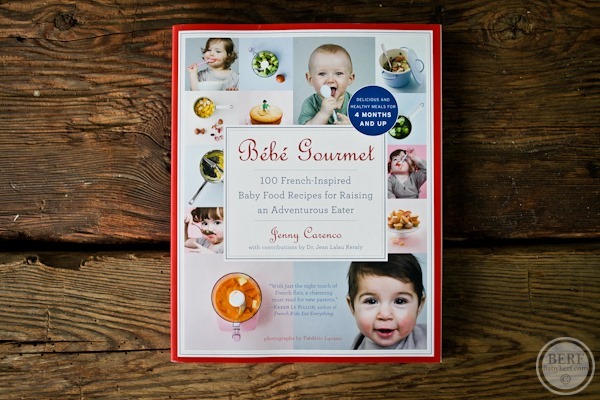 To win a copy of Bébé Gourmet, enter here! Here is a link to Amazon for more info on the book. And you can talk to Bébé Gourmet on Facebook and Twitter. Fun book! I’ve got a few friends about to be first time mommies and this would be a fantastic gift like you said 😀 Thanks, K! I got this book after I saw Ashley at (never)homemaker post about it. 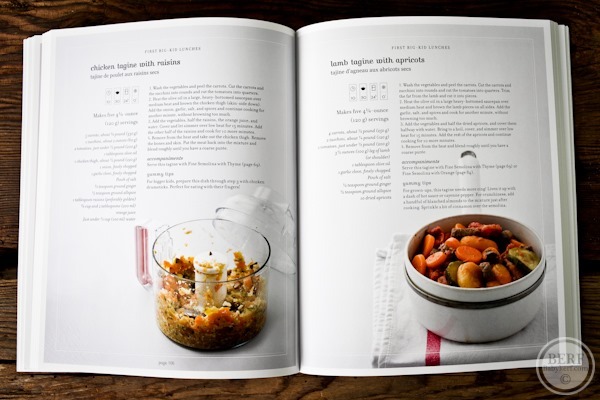 Some of the recipes are a little “fancy” for even my husband and I…although he’s now on this kick where he wants me to make fancier dishes, so maybe this is a good thing. 🙂 I need to flip through it again when on vacation later this week and plan some meals. With Lucy at 9 months now (and FIVE new teeth coming in all at once), it’s time to move on past the purees. Even though the pouches are pricey, we’ve been relying on those 95% of the time for both home and daycare because they’re so convenient. I have truly loved making my 9 month olds, Archie, food for him. It has been so fun to watch him try new textures and flavors. This book looks awesome! I’m wondering (in a non judgemental, you’re-his-mama way!) why you don’t seem to have gone the baby led weaning route? 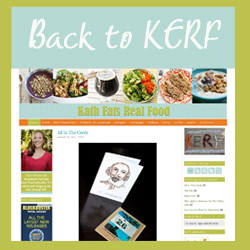 It just seems to fit your real food philosophy so well, I admit to being surprised you didn’t go there. Any reasons behind that, or was it just not right for you? I wrote about that in this post on our first foods 🙂 Basically Mazen just didn’t go for it. He choked a few times. 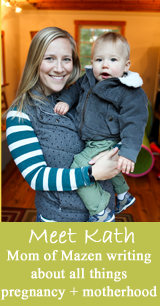 I don’t think there is a right or wrong way – just what is best for your baby’s personality. While I don’t have a little kiddo of my own, I envision myself making my own baby food. I’ve mentioned the idea of making my own baby food (once a baby was in the picture) to people in the past and they looked at me like I was an alien for having that desire! I’ll keep this cookbook in mind if that day ever comes, and I’ll be sure to let my new-mom and pregnant friends know about your giveaway! I’m all about making family meals that baby can enjoy too! Who wants to prepare more than one meal at a time if they don’t have to?! I’ve read so many renowned babyfood “cookbooks” and every recipe basically means boiling/steaming with water then pureeing…doesn’t sound like much of a recipe to me, lol! I love incorporating different flavours, textures, especially herbs/spices in my baby’s food. I followed the same motto with my first and needless to say he is an EXCELLENT eater! He’s even tried wild boar and loves fish roe…who would have thought?!! On a sour note, since I dedicate most of my time to preparing recipes for my blog (www.bitesforbabies.com) I rarely have time to prepare the recipes I used to make (for my husband)! Lol!